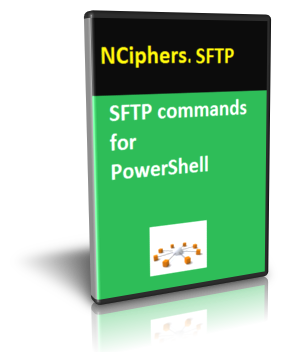 SFTP commands for PowerShell will allow you to perform SFTP communication in minutes. The cmdlets offer the commonly use SFTP commands directory create, delete, list, upload, download; file upload, download, delete, check for existence, size, modification date, etc.. Check our Online Tutorial for complete examples. SFTP commands for PowerShell supports RSA and DSA SSH keys authentication over SSH 2 channel. Username/Passwords and SSH keys authentication are supported. The package supports SSH.com, OpenSSH and PuTTY keys.